Double Flaring Single Flare Tool Set Fuel Brake Lines 3/16, 1/4, 5/16, 3/8 1/2"
1.Made of durable hardened steel.2.The ridgid flaring tool is a precision designed tool for producing 45 Degree flares in soft copper, brass, aluminum and mild steel tubing.3.It has a hardened, smooth cone that provides a fast 45 Degree flare.4.It has a single clamp screw that provides easy clamping and removal of the tubing.5.Plastic molded carrying case for neat storage.Package Content and?Specifications:1 x?45 Degree Eccentric Cone Type Flaring Tool2pcs x Flaring?Die, Size(O.D):(Inch: 1/4-inch, 5/16-inch, 3/8-inch, 1/2-inch, 5/8-inch, 3/4-inch, Model: CT-806A. Metric: 6mm, 8mm, 10mm, 12mm, 16mm, 19mm, Model: CT-806M)1 x Inner-Outer Reamer1 x Rolling Type Tube Cutter, fit for tube diameter?range:?4mm to28mm(1/8-inch to 1-1/8-inch)For CALIFORNIA residents only: WARNING: This product contains chemicals including DEHP, which is known to the State of California to cause cancer and birth defects or other reproductive harm.Please note that by posting this Proposition 65 warning, we are notifying you that one or more of the Proposition 65 listed chemicals may be present in a product. With Unique Bargains' products, the exposure to these chemicals may be of no significant risk to you, but out of caution, we have elected to place this warning on our site to make sure our customers are informed.You can find more information at http://www.oehha.ca.gov/proposition-65/about-proposition-65. 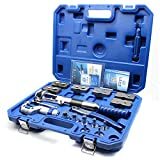 Shankly Flaring Tool Set (10 Piece - Professional Grade), Heavy Duty Steel Flaring Tools Kit and Swage Tool, Flaring Tool with Tubing Cutter Included. 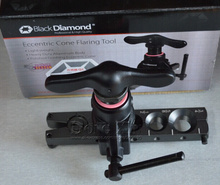 (This is not a Double Flaring Tool). 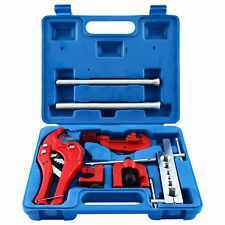 ALL INCLUSIVE KIT: Shankly's flaring tool kit is all inclusive, complete with a professional a tubing cutter, allowing the mechanic to focus on the job rather search for parts. Please note: this is a standard flare tool, NOT a double flaring tool.. WIDE RANGE OF FLARE ADAPTERS: flaring tool adapters range from the following sizes: 1/8", 3/16", 1/4", 5/16", 3/8", 7/16", 1/2", 5/8", making this the only flaring tool set a mechanic will need. 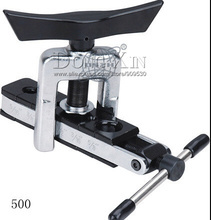 (Metric: 5mm, 6mm, 8mm, 10mm, 12mm, 14mm, 16mm). COMMON SWAGE FITTINGS: Skankly flaring tools include five swage fittings and several useful tube sizes: 3/16", 1/4", 5/16", 3/8", 1/2", 5/8", creating a rugged and long lasting flaring tool, swaging tool kit.. PRECISE AND CONVERTIBLE: This flaring kit swivel-type swaging adapters and flaring cone are made of the sturdiest steel materials and chromed finished for easy operation and precision..
SELF-CENTERING YOKE: Shankly's brake line flaring tool includes two bars covering nine sizes with a self-centering, slip-on forged steel yoke to help form professional and quality flares and swages..
Professional and Flaring Tool with Tube CutterShankly flaring tools is a complete and professional flaring tool. Shankly's flaring tool also includes a tubing cutter, offering a universal and inclusive single flaring tool set (not a double flare).Adaptable and CompleteShankly's tube flaring tool features flaring tool adapters range from the following sizes: 1/8", 3/16", 1/4", 5/16", 3/8", 7/16", 1/2", 5/8", making this the only flare tool set a mechanic will need. Skankly flaring tool includes five swage fittings and several useful tube sizes: 3/16", 1/4", 5/16", 3/8", 1/2", 5/8", 3/4", creating a perfect flaring tool kit, swage tool kit and flaring and swaging tool kit. Tube and die set stabilizing arm for easy tube forming. Magnetic adapter holder keeps adapters in place. Equipped with an enlarged die set compression area for better grip of dies. This tool can be used on "Annealed Steel" & "Dead Soft".Create perfect production quality flares on annealed stainless steel tubing, terne plate steel tubing, soft aluminum and soft cooper tubing. Includes Mastercool 70027 mini tube cutter for 1/8" to 5/8" (3 - 16 mm) O.D. tubing (1/8 to 1/2" nominal). 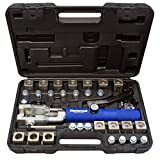 This kit fabricates Push Connect 1/4, 5/16 and 3/8"; GM Fuel Line Flare, Brake Lines and Transmission 5/16 and 3/8"; Flare/Double Flare 3/16, 1/4, 5/16, 3/8 and 1/2"; Metric Bubble Flare 4.75, 6, 8, and 10mm. Comes in a custom molded box. (patent # 5,782,128). ❀100% brand new and high quality,Durable..
❀New technology surface treatment, fine polishing. Easy to Install without installation. ❀Made of durable hardened steel.Suitable for create soft copper and aluminum joints for plumbing use..
❀PVC environmental protection handle, anti-skid,plastic molded carrying case for neat storage,easy to carry..
❀Long handle with cushioned grips for comfortable leverage while operation..